Note: the pattern uses DMC Petra 3, which is unavailable. An alternative yarn has been selected - please complete a Tension Swatch. You will also require a size 3.00 crochet hook, florist's wire (allow approx. 20 to 25cm for each stem) and green florist's tape. 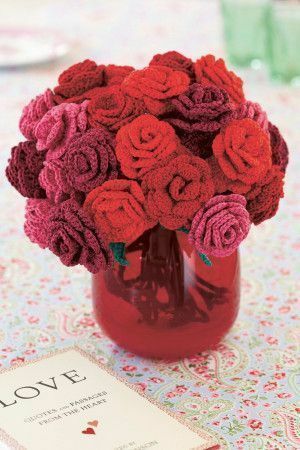 This is the best kind of rose bouquet - it'll always look perky! This crochet pattern contains the design for a lovely open flower rose and directions for creating a version that isn't quite as open. Make in an array of colours for a really special gift.